Gatekeeper is a cloud-based management platform designed to help businesses handle their suppliers and contracts better. The solution provides companies with a cloud-hosted information hub where they can store and manage all their supplier and contract information centrally. With Gatekeeper, information management becomes less complicated and handling complex relationships becomes a breeze as all intelligence, messages, dates and key documentation are stored in one place, constantly updated across different teams and departments. 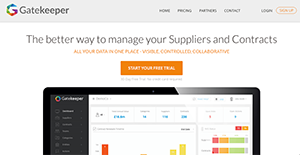 With Gatekeeper, users enjoy a secure database for all supplier and contract information that they can access anytime. With its powerful search feature, finding the right data is quick and easy from any view. Deadlines and milestones are important in any business model, which is why Gatekeeper keeps users updated with approaching deadlines with its intelligent dates feature. Any view can be exported in various formats as well. As Gatekeeper centralizes all infomation, users also get a centralized hub for communications. They can email directly from the system to specific suppliers and contracts for a clear and transparent audit trail. Powerful analytics supply users with intelligent information they need to make better decisions, maximize renewal opportunities and more. Integration with leading business apps and tools also add more value to Gatekeeper, enabling users to fully use the system to achieve their business goals efficiently and effectively. If you are considering Gatekeeper it could also be a good idea to analyze other subcategories of Best Contract Lifecycle Management Software gathered in our database of SaaS software reviews. Each enterprise has different requirements and needs an application that can be customized for their size, kind of workers and buyers, and the specific industry they are in. For these reasons, no platform can offer perfect functionality out-of-the-box. When you search a software app, first be sure what you need it for. Read some Gatekeeper reviews and ask yourself do you need basic functionality or do you want sophisticated features? Are there any industry-specific tools that you are seeking? Find the answers to these questions to aid your search. There are lots of elements that you need to consider and these include your finances, specific business wants, your organization size, integration requirements etc. Take your time, try out a few free trials, and finally zero in on the platform that provides all that you need to boost your firm efficiency and productivity. We realize that when you make a decision to buy Contract Lifecycle Management Software it’s important not only to see how experts evaluate it in their reviews, but also to find out if the real people and companies that buy it are actually satisfied with the product. That’s why we’ve created our behavior-based Customer Satisfaction Algorithm™ that gathers customer reviews, comments and Gatekeeper reviews across a wide range of social media sites. The data is then presented in an easy to digest form showing how many people had positive and negative experience with Gatekeeper. With that information at hand you should be equipped to make an informed buying decision that you won’t regret. What are Gatekeeper pricing details? What integrations are available for Gatekeeper? If you need more information about Gatekeeper or you simply have a question let us know what you need and we’ll forward your request directly to the vendor.